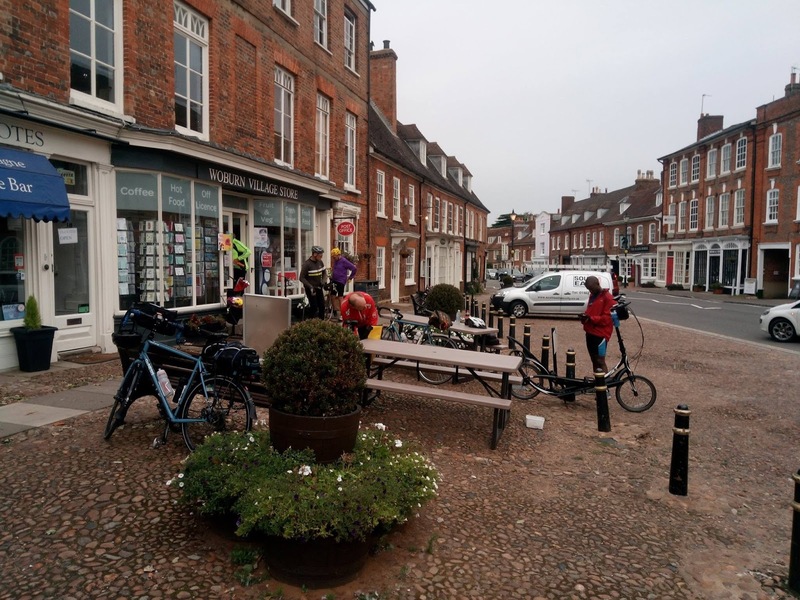 Chris writes: I've been thinking of trying to ride 300km in one day for about three years, ever since I ended up riding 260km due to the lack of cycle provision on trains back from Norwich. 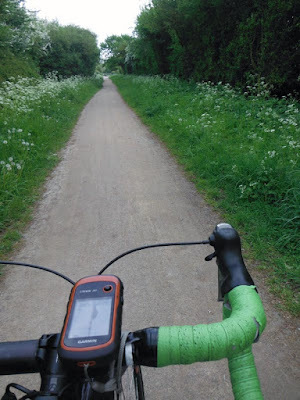 At the time I had felt that I would have been happy to continue for another 40km if I had had to, but once I was that close to home I wasn't particularly inclined to go out of my way. This year, after a couple of 200km Audaxes and a few weeks over the summer riding a large bike loaded with 70kg of children (including some hills! ), I felt like it would be a good time to finally get around to trying a 300. Nigel recommended the Four Minute Mile, a new 200km audax calendar event on 22nd September. It's "only" 215km but conveniently starts in Stevenage, about 45km from home. If I rode from home to the start, did the 215km event and then rode back home it would make exactly 300km. I liked the idea of having the option to get the train home from the finish if the idea of riding another 50km seemed too much! So I signed up for the Four Minute Mile and made use of Audax UK's Extended Calendar Event system to register my ride to and from the start - so that in theory I could get credit for 300 if the day went well. On the day I got up at 4am, dressed, downed a cold coffee I'd made the night before, ate half a raisin danish and hopped onto the bike I'd left ready by the front door. At the start point in the centre of the village I spent a couple of minutes adjusting my layers before setting off. A few minutes later I worked out that the constant chirruping from the backup GPS was from one of the children fiddling with the settings on holiday, and stopped to fix that. Finally I was properly off! I really like riding early in the morning. In return for dragging yourself out of bed there's a very peaceful ride and glimpses of the still-active wildlife which is normally out of sight. This morning was no exception: I had gone 20 miles before I came across the first car on the road but instead saw some muntjac deer, hares, and possibly the back end of a badger disappearing into a hedge. I arrived at Costello's Cafe in Stevenage a few minutes after 7am, in plenty of time for the start of the Four Minute Mile at 7.30am (and a snack beforehand). 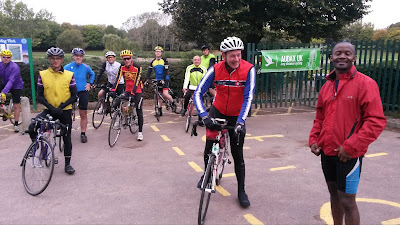 A few other riders were there, though not as many as it looked like there should be from the brevet cards on the table. Perhaps people had been put off by the weather (light rain was predicted); I later learned that Nigel and another Cambridge rider couldn't get to the start by train due to the line being closed. The first control was at Woburn after 44km and a first taste of the Chilterns. This control (and all the others until the finish) was a "free" control, which means you have to get a receipt to prove you've been there. I bought a milkshake and a chocolate bar from a small shop rather than spend time in the restaurant nearby. However once I'd done that I noticed the tiny cafe in between and decided to sit down and have a cake. This also allowed me to obtain a water refill and to make use of their facilities. After all that I'd spent 45 minutes stopped. This was longer than I'd really intended, but I was still in reasonable time. It was just starting to rain a little. Standing still outside I was getting a bit shivery, but it didn't take long to warm up once I started pedalling. Along the next section I caught up with Idai Makaya, well known for riding long distances on an ElliptiGO, and rode with him for a few miles. He seems as nice and friendly in real life as on the internet. The next stop was Long Crendon at about 87km; I once again bought a snack at a village shop and managed a shorter stop than last time. From there it was a relatively short ride to the half-way control at Iffley Road Stadium in Oxford, where the four minute mile was first broken in 1954. Riding through larger towns, with all their junctions, is always quite a bit slower, but I still had time to get the all-important receipt and sit down for some sandwiches in the stadium cafe, where some tables were reserved for us; they'd even provided a large jug of water. Once we'd left Oxford (by the same route we entered), we picked up the very enjoyable Phoenix Trail Greenway: a former railway turned into a traffic-free (and straight) cycle and walking route with a good surface from Thame all the way to Princes Risborough (about 10km). After that nice surprise was the part I had been fearing: riding through the infamous Chiltern Hills with about 200km already in my legs. My bottom gear got a lot of use, but I managed to get up all the hills (with the exception of a few meters I walked when I was caught in the wrong gear) and eventually made it to Chesham for the next control at a Costa, which was just what I needed: a mocha and cake, plus a dry place. Although the Chilterns were more or less behind me by now, the hill just past the Chesham control was a whopper, and must have been close to a 20% grade! 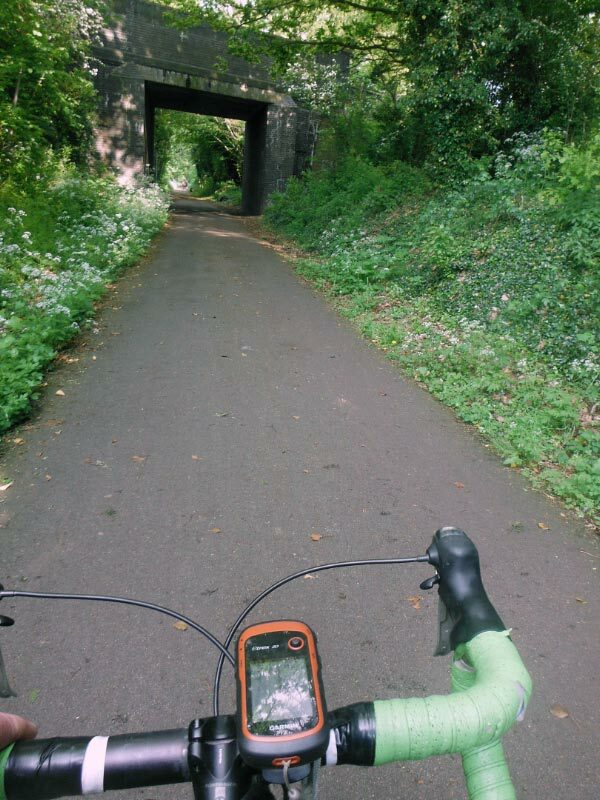 The next part of the route was through the familiar towns of St Albans and Hatfield, linked by the fantastic Alban Way - another former railway turned paved cycle/walking path. After Hatfield I did start feeling quite hungry, but also became aware that I was getting a little short on time so I didn't stop until I reached the next control at Welwyn Garden City. I made it to a Co-op for some quick food and drink (and another receipt) with about 15-20 minutes to spare. I ate quickly outside and pushed on with the remaining 14km to the finish of the Four Minute Mile at the Chequers pub on the edge of Stevenage. I arrived about 15 minutes before the time limit, and just in time for a hot chocolate. Phew! I can heartily recommend the Four Minute Mile. The organiser, Phil Whitehurst, was very welcoming and had obviously enjoyed the chance to share some of his favourite parts of the nearby countryside (and also his favourite climbs). I was particularly impressed by his attention to detail: in the days before the ride we were even given information about when we might encounter riders from a sportive in an overlapping area, and the breakfast menu from one of the stops on offer in Woburn. 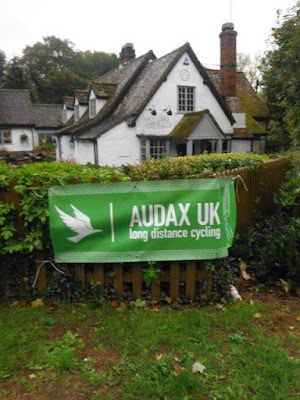 Having finished the 200km Audax I now had nearly 268km on the clock - already my longest and hilliest ride so far - but I still had to get home. My legs were feeling surprisingly good, and (since the minimum speed for the extended 300km is 14.3kph rather than 15kph for the 200k) I had plenty of time to get back. I was more worried about having filled out the forms incorrectly than running out of time! The ride home from Stevenage was nice - it was late enough that the roads were once again nearly empty; the rain had stopped and the roads were essentially dry, and the animals had started to come out: I surprised a pair of roe deer near Catmere End. Plus, since I passed the 300km point a few km from where I started, it became clear that I would reach my secondary goal of 200 miles (322km) without facing the dilemma about whether to ride another loop before going to bed just to get up to the imperial round number. If you'd like to ride the Four Minute Mile yourself there'll be another calendar event in June 2019. You can also ride it at any time by entering the permanent version.